The Lift-Rotate unit changes the orienta- tion of the workpiece pallet. In some sys- tems this may be done to ensure that the workpiece pallet’s leading edge remains the same regardless of workpiece pallet transfers. In other instances, workpiece orientation may be changed to simplify assembly or handling processes. The Lift-Rotate unit is mounted to the underside T-slots of a conveyor section. The included controller enclosure, containing the motor drive package and terminal strip for all wiring connections, is mounted to the side T-slots of the conveyor section near the lift-rotate unit. The lift plate on the lift-rotate unit con- tacts the workpiece pallet support plate and fits into the corners of the workpiece pallet’s frame. 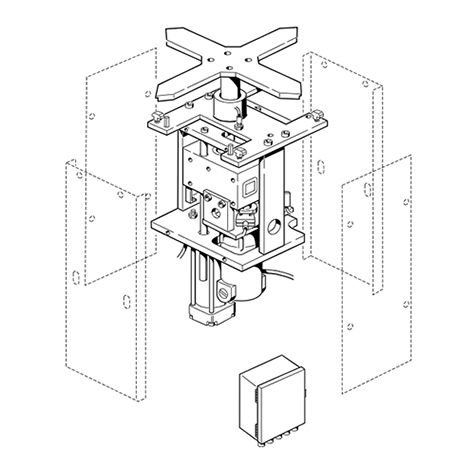 Lift is provided by a pneumatic cylinder, with a payload of up to 30 kilograms. The lift-rotate unit lifts the workpiece pallet 68 mm above the belt height. Lift and lower speed can be set with adjustable pneumatic flow control valves. An electronic speed control permits adjustment of the Rotation speed. The controller contains logic to complete one 90° rotate cycle for each start pulse received from the system controller.